“In a move that should surprise no one, Pope Francis has once again appeared to contradict two millennia of clear and consistent scriptural and Catholic teaching. There has always been disagreement among Catholics about whether capital punishment is, in practice, the morally best way to uphold justice and social order. However, the Church has always taught, clearly and consistently, that the death penalty is in principle consistent with both natural law and the Gospel. This is taught throughout scripture—from Genesis 9 to Romans 13 and many points in between—and the Church maintains that scripture cannot teach moral error. It was taught by the Fathers of the Church, including those Fathers who opposed the application of capital punishment in practice. For the rest of this excellent analysis, click here. 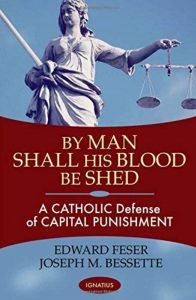 Recommended book by Edward Feser published by Ignatius Press. Feser makes an excellent point (among many excellent points) about Pope Francis’ lack of clarity on previous things he has said or written. My prediction is that when he, as opposed to the CDF, speaks or writes on this subject, he will lack clarity again. As always, we should pray for the Holy Father, and ask the Holy Spirit to guide him. I think the reasoning is problematic. According to the pope we don’t need the DP because of “modern prisons.” But that’s rather Eurocentric. Plenty of countries lack the ability to run a prison system that keeps guards, other inmates, and the public from murderers. I think the pope believes that the DP is intrinsically immoral but doesn’t want to make such a dramatic change. Some would argue that in John 8:3-11, Jesus did not explicitly say that capital punishment is wrong, but he still gave the impression that we who are also sinners do not have the right to take life, even the life of a criminal who was called to be stoned to death according to the Law of Moses. Steve Ray here: I don’t think John eight has any implication for capital punishment. The Jews were acting as hypocrites and Jesus called him out on it. Romans 13 is very clear that the state does bear the sword with authority from God. To add to Steve’s reply to Jessica: In the Old Testament, God COMMANDED the death penalty for certain crimes. Thanks for following up, Steve! (I’m a huge fan by the way, especially as a fellow Catholic convert. I share your talks and videos all the time!) So when Jesus said that he didn’t condemn her and go sin no more, why did he let her go if her just punishment was death according to the law? I guess I’ve always seen capital punishment in the passage, as well as hypocrisy. Bill912: That was my point. Adultery is a crime which God commanded capital punishment. Not sure what you were trying to add there? That Jesus could not have been condemning capital punishment per se, because, in the Old Testament, He commanded capital punishment for certain crimes. Previous post: Is God Like a GPS System? Next post: Why are some ex-Catholics so hateful?